This is a common sight in Ajijic. I've lost count of the number of times I've had to make a detour because of a horse parked in the middle of the sidewalk. 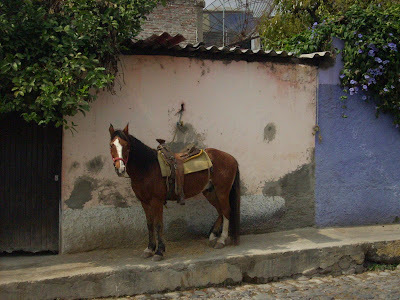 In Ajijic, we travel by bike, horse, golf cart, 4-Wheeler, motorcycle, cars, and trucks. And, yes, by foot. Just watch the rocks!